WRENTHAM — Town Administrator Kevin Sweet is pleased to announce that he has appointed Rachel Benson to be Wrentham’s new Director of Planning & Economic Development. Benson, a Plainville resident, began her new role on Jan. 14 after working as the Assistant Town Planner in Grafton. Prior to that she worked in the private sector for Meridian Associates and Nitsch Engineering as a Land Use Specialist and Survey CAD Technician. Benson is a U.S. Air Force veteran where she served as an Engineering Journeyman. She currently volunteers in her hometown of Plainville as Vice Chair of the Planning Board and is a member of the Plainville Zoning Board of Appeals. She holds a bachelor’s degree in Geography from Bridgewater State University and is working toward the completion of a master’s degree in Urban Planning and Community Development from UMass Boston. The Wrentham Planning & Community Development Department provides guidance, coordination and advisory planning services to the Town. The Department’s focus is on (but not limited to) land use, planning, zoning, economic development, affordable housing, open space and land preservation. Working with Town departments, boards, committees and community organizations, the Planning and Community Development Department helps develop policies, program initiatives and recommended zoning provisions to guide the future development of the community in alignment with the town’s Master Plan. 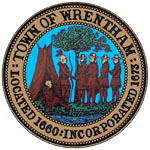 WRENTHAM — The Town of Wrentham Planning and Community Development has released its first newsletter today to provide residents with an update on where several key projects stand that are ongoing in town. Those projects include the CVS and Cumberland Farms construction at Wampum Corner and the Ledgeview project along Route 1. The role of the Department of Planning and Community Development is to help the town plan and implement initiatives that will attain the vision of the residents for the future of the town.